Et partikkelfilter fjerner over 90% av sotpartiklene. På en bil med partikkelfilter er det ofte renere på innsiden av eksosanlegget enn utenpå. Partikkelfilteret tar opp alle sot og røykpartikler som motoren produsere, og vil derfor over tid bli mettet med partikler. Partikkelfilteret må derfor regenereres (fribrennes) med gjevne mellomrom Hvor ofte avhenger av mange faktorer, men den viktigste er kjøremønster. Ved f.eks bykjøring med mange start og stopp og lave hastighteter vil filteret mettes uten at det får muligheten til å regenereres. Dette fordi regenereringen først skjer når filteret har oppnådd en hvis temperatur (over 600 grader). Dette kan føre til at diagnosesystemer varsler om feil på partikkelfilteret. For å unngå dette er det smart å variere kjøremønsteret noe og ta noen turer med litt høyere hastighet innimellom, slik at filteret kan regenereres. Ved kjøring utenfor byområder vil filteret fribrennes ved behov. Er hastigheten og motorturtallet høyt nok vil det ikke være behov for noen styrt regenerering fordi filteret da vil holde en så høy temperatur at partiklene brennes kontinuerlig. Selve partikkelfilteret ligner på en katalysator, men er tett og tillater kun at eksosen passerer gjennom porene i selve filterkroppen. Her en artikkel om partikkelfilter eg fant på nettet. Her er det mye god informasjon. Vil etter hvert bli oversatt. The latest bane of a diesel driver’s life is the Diesel Particulate Filter. The purpose is to absorb particulate emissions created during the start-up phase of an engine from cold. These absorbed particulates are then superheated and burned off during the regeneration cycle of the DPF. There are two DPF cycles: passive and active. Passive regeneration takes place automatically on motorway-type runs when the exhaust temperature is high. Many cars don’t get this sort of use though so manufacturers have to design-in ‘active’ regeneration where the engine management computer (ECU) takes control of the process. Active Regeneration occurs when the level of soot in the filter reaches around 45%. The ECU makes small adjustments to the fuel injection timing and increases the exhaust gas temperature. This increases the exhaust temperature which then initiates the regeneration process, burning away the soot trapped in the DPF. On passive cycle the DPF will require the car to regularly be driven significant distances at relativey steady revs of 1,750rpm to 2,500rpm for the DPF to get hot enough to regenerate and burn off the particulates in it. DPFs also have an ‘active’ cycle where additional fuel is injected into the combustion chambers to create hotter than normal exhaust gases to burn off particulates in the DPF. However, this does not always work, particularly if the car has done a high proportion of short runs from cold starts and instead of burning off the particulate the extra fuel can instead find its way into the engine sump, contaminating the lube oil and sometimes leading to such a rise in sump oil level that the engine can start to run uncontrollably on its sump oil and will self-destruct. The alternative ‘active’ cycle is an additional injector that injects either diesel fuel or an additive directly into a burner in the particulate filter. Peugeot/Citroen/Ford diesel engines don’t need to get quite as hot as diesels in other makes because they use an additive to help regenerate the DPF. This used to be added to a tank under the back seat, but is now contained in a bladder that needs to be repalce around every 100,000 miles. As widely predicted, the problem is that diesel particulate filters have a limited life of perhaps 80,000 to 100,000 miles before they become completely clogged with ash, cannot be cleaned out or ‘replenished’ and need to be replaced. Many owners are now finding out that the cost of that can be anything from £1,000 to £3,500 – possibly as much as the value of the car and certainly far more than the saving on fuel from driving a diesel car rather than a petrol one. And, despite a plethora of specialists offering DPF removal services, this is actually illegal (though by November 2013 VOSA had still not found a way to check up on it and it had not yet become part of the MoT). Then, on 6-12-2013, as Honest John had frequently warned, removal of a Diesel Particulate filter has always been illegal under EC law. VOSA announced that garages and testing stations will be required check for a diesel particulate filter (DPF) in the inspection of the exhaust system as part of the MoT test (or annual test for heavy vehicles) from February 2014. The vehicle will automatically fail the MoT test if a DPF was originally fitted as standard but is found to be no longer present. The filters need to be ‘regenerated’ regularly through burning the soot to gas at a very high temperature, leaving behind a residue. If not carried out properly, regeneration can lead to a build up of soot and ash, which can affect performance. This has led to some diesel vehicle owners opting to remove the filter, which makes their car illegal for road use. DPFs of HGVs are regularly cleaned by the Ceramex process that restores their functionality to more than 90%, and this service is now being offered to car owners via Unipart and Alliance Car Centres and is on trial at six branches of KwikFit. More information can be found via the Diesel particulate filters guidance note that will be updated to reflect the changes to the MoT test. Question: The glow plug symbol is flashing. Why? What should be done? a.) Frequent short distance journeys, i.e. high soot loading while at the same time regeneration of the DPF does not take place because the conditions necessary were not fulfilled. a.) Engine running since start for longer than 2 minutes. b.) Calculated saturation higher than 80%. c.) Coolant temperature over 70°C for at least 2 minutes. Question: Under what conditions is regeneration interrupted/ended once it has started? a.) After a maximum regeneration time (20 – 25 min.). c.) If the engine is left idling for a long time (5 – 10 min.). e.) If during regeneration, a fault is detected on the components relevant for combustion (injection/intake system). If a regeneration is interrupted once started but before it has been 50% completed, the glow plug lamp flashes on the next engine start (cold or hot) and regeneration begins again once the operating conditions (see 3) have been fulfilled. Question: How long does complete regeneration take? a.) In the most favourable case? b.) In the least favourable case? Answer: a.) Under constant conditions, i.e. the exhaust temperature necessary for regeneration always lies above the required value, for example during motorway/cross-country driving, the average regeneration time is 10 minutes. b.) Vehicle conditions such as long down-hill descents, frequent driving in the low-load range (city driving, idling) allow the exhaust temperature to fall. If the conditions for triggering regeneration were fulfilled, the active regeneration time can be extended up to 25 minutes (depending on engine type). If complete regeneration is not possible within this period, the regeneration will be interrupted. Question: How does regeneration affect the oil life? Answer: On each regeneration or attempted regeneration, a certain diesel fuel amount is injected into the engine oil which reduces the oil life. If the “INSP” light in the instrument cluster comes on, the engine oil is exhausted and must be changed. Failure to do so could damage the engine. Traditional Diesel Particulate Filter systems consist of a filter material positioned in the exhaust designed to collect solid and liquid particulate matter emissions while allowing the exhaust gases to pass through the ceramic walls. Catalyzed Diesel Particulate Filters (CDPF) are designed not only to achieve collection efficiencies of 90% or greater in terms of mass (over 95% when expressed as number of ultra fine particles), but also to burn off the collected particulate matter into carbon dioxide and water. The incorporation of catalytic coating in CDPFs lowers the temperature at which particulate matter burns. To achieve this auto-ignite and the sustain combustion of collected particulate matter CDPFs must attain a minimum temperature of approximately 250C that can be helped by electrical heating if the engine-out exhaust temperature of a heavy-duty engine does not typically achieve this required temperature level. These types of particulate filters must be regenerated. Regeneration of a DPF is to remove accumulated soot/carbon. Two general approaches are continuous and intermittent regeneration. In continuous regeneration, a catalyst is provided upstream of the DPF to convert NO to NO2. NO2 can oxidize carbon at typical diesel exhaust temperatures and thereby effectuate continuous regeneration. A disadvantage of this approach is that it requires a large amount of expensive catalyst. This technique is not commonly used on cars but is found on public transport vehicles / council vehicles. Intermittent regeneration involves heating the DPF to a temperature at which carbon combustion is self-sustaining in a lean environment. Typically this is a temperature from about 400 to about 700 degrees C., depending in part on what type of catalyst coating has been applied to the DPF to lower the soot ignition temperature. A typical way to achieve carbon combustion temperatures is to inject fuel into the exhaust upstream from the DPF, whereby the fuel combusts generating heat in the DPF or an upstream device. In most modern cars the catalyst is injected into the fuel tank and is effectuated through the fuel injection system. Here is an extract from the press conference launching the Ford’s cDPF system on the 2009 Fiesta 1.6TDCI. “Coated Diesel Particulate Filter (cDPF): Ford’s optional cDPF system traps carbon deposits as they exit from the combustion system, preventing their release into the atmosphere. Under favourable conditions the system then cleans itself with a controlled ‘burn-off’ process, thus providing a self-contained clean air system without the need for service maintenance. This system contains a ceramic filter body of around 4 litres volume mounted behind the exhaust manifold plus a special regeneration support unit on the engine’s intake manifold. Together these components enable the filter system to regenerate in any possible drive condition automatically without requesting any input from the driver and without compromising driveability noticeably during regeneration. * Additive systems have an additional additive tank that primes the fuel tank with the additive (a metallic catalyst) at every refuelling. On the Ford cDPF the additive is embedded in the filter washcoat, hence no additional complex priming system is required and no refilling of the tank. Detailed below is important information outlining the function and features of the Diesel Particulate filter which all members of your team need to be aware of. Diesel particulate filters are becoming more commonplace on diesel engines, particularly sizes 2.0L upwards. This is in order to reduce the exhaust emissions as required by European legislation. exhaust and into the atmosphere. The DPF can hold a certain amount of soot, but not a huge quantity and therefore it needs to go through a process called ‘regeneration’ in order to clear the soot loading. When the soot goes through a ‘regeneration’ process it will be converted to a much smaller amount of ash. The ash is non-removable. There are two types of ‘regeneration’, passive and active. During long motorway journeys, passive regeneration will occur. This needs no intervention from the engine control unit. Due to the raised exhaust temperatures on a long journey (temperatures between 350 and 500°C), the procedure occurs slowly and continuously across the catalytic-coated (with platinum) DPF. The catalytic-coated DPF is situated close to the Engine, therefore the exhaust gas temperature is high enough (500°C) to ignite the soot particles. Due to this soot is burned-off and is converted into a smaller amount of ash. Active ‘regeneration’ is when the ECU intervenes when the soot loading in the DPF is calculated to be 45%. The procedure lasts for about 5 – 10 minutes. Specific measures are taken by the ECU to raise the engine exhaust temperature to above 600°C, these include switching off the exhaust gas recirculation and increasing the fuel injection period to include a small injection after the main injection. The soot particles are oxidised at this temperature. The ECU will trigger a regeneration process, if for some reason this is aborted, ie. customer slows down, stops etc, the process will be resumed when regeneration conditions are once again met, above 60km/h (38mph). This will continue for 15 minutes. If after 2 attempts of 15 minutes, a successful regeneration has not been possible, the loading will increase. At 50% soot loading, the ECU will continue to maintain maximum exhaust temperatures of 600°C to 650°C to cause a regeneration process. The system will try to run a regeneration process for 15 minutes. If unsuccessful, the system will repeat this process for a further 15 minutes, if still unsuccessful, the DPF light on the driver display panel will then be lit. The owners handbook states, the DPF symbol lights up to indicate that the diesel particulate filter has become obstructed with soot due to frequent short trips. When the warning lamp comes on, the driver should drive at a constant speed of at least 60 km/h for about 10 minutes. As a result of the increase in temperature the soot in the filter will be burned off. If the DPF symbol does not go out, the driver should contact an authorised Volkswagen repairer and have the fault rectified. At 55% soot loading the DPF light is lit on driver display panel. At this point the customer should follow the advice in the handbook. If they ignore this information and continue driving the vehicle until the soot loading reaches 75% without successful regeneration, additional warning lamps will light up. At this point the customer will also be complaining of lack of power, etc. At 75%, regeneration is still possible with the use of the VAS tester. Only when the loading is above 95%, is it necessary to replace the DPF unit. customers failure to comply with the instructions in the handbook, DPF replacement will not be paid for by warranty. • Frequent short journeys – Regeneration conditions are not met. Not recommended for sale in the Channel Islands and inner city driving. system components (if applicable), poor connections, wiring issues, etc. • Before diagnosing a problem vehicle or attempting to perform an emergency regeneration, it is important to obtain a full diagnostic log and read out relevant measured value blocks. These MVB’s contain important information on the condition of the DPF system and are essential in diagnosing the fault. When the DPF light is illuminated, it does not necessarily mean that the DPF requires regeneration. For further advice, please contact Technical Support with the information from the diagnostic log and MVB data. • If a problem vehicle arrives with the DPF light, the engine management light and the emissions light on. If during your diagnosis and reading of relevant MVB’s, you find that the soot loading exceeds 75% (but is still below 95%), an emergency regeneration procedure must be performed with the VAS tester. Further to this, the customer needs to be educated. They need to understand why the lights have appeared on the dash panel. Their attention needs to be brought to the owners handbook instructions, so that they are aware of what the DPF light means and what to do when it appears. This should prevent unnecessary repeat visits for regeneration purposes. Diesel emissions are 90% lower than they were in the 1980s; however exhaust regulations based on statistical studies dealing with the health impact of exhaust emissions continue to demand even lower gaseous and particulate diesel emissions. Particulate emissions are responsible for the characteristic black exhaust fumes emitted from the diesel engine. They are a complex mixture of solid and liquid components with the majority of particulates being carbon microspheres on which hydrocarbons from the engines fuel and lubricant condense. In order to comply with the strict European Stage IV emission standard, which now stipulates a further 50% reduction in particulate emissions, an exhaust emission control system is used on the XJ 2.7 liter and S-TYPE 2.7 litre diesel vehicles. The primary component of the system is the diesel particulate filter (DPF), which has been proven to be effective in reducing particulate emissions to negligible levels. 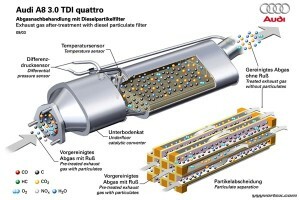 The main ability of the particulate filter is its capacity for regeneration; that is burning the particulates trapped in the filter at calculated intervals in such a way that the process is unnoticed by the driver of the vehicle. 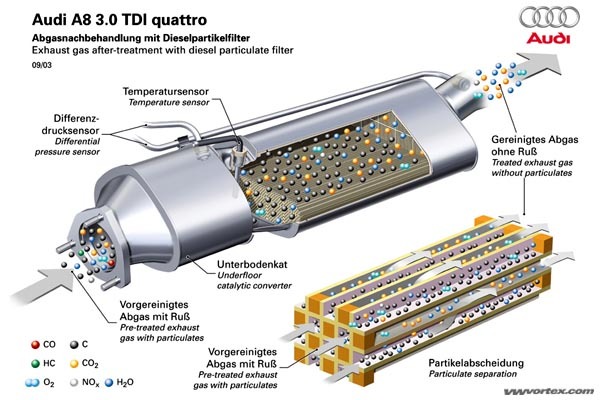 To enable the exhaust emission control system to store and when conditions determine, burn the particulates, the diesel particulate filter uses new filter technology based on a filter with a catalytic coating. 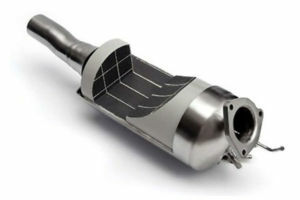 Made of silicon carbide the filter is packaged into a steel container installed in the exhaust system of the vehicle. The filter has good thermal shock resistance and thermal conductivity properties, plus a closely controlled porosity. The filter is tailored to the engines requirements to maintain the most favorable exhaust backpressure. 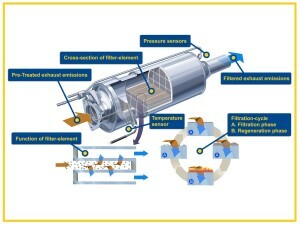 The porous substrate in the filters interior consists of thousands of small parallel channels running in the exhausts longitudinal direction, adjacent channels in the filter are alternately plugged at each end. This arrangement forces the exhaust gases to flow through the porous walls, which acts as the filters medium. Particulates that are too big to pass through the porous walls are left behind and stored in the channels. To prevent the particulates creating an obstruction to the exhaust gas flow, the filter system provides a regeneration mechanism, which involves raising the temperature of the filter to such an extent that the particulates are incinerated and as a result removed from the filter. The most important parameters influencing filter regeneration is the temperature of the exhaust gases and filter. 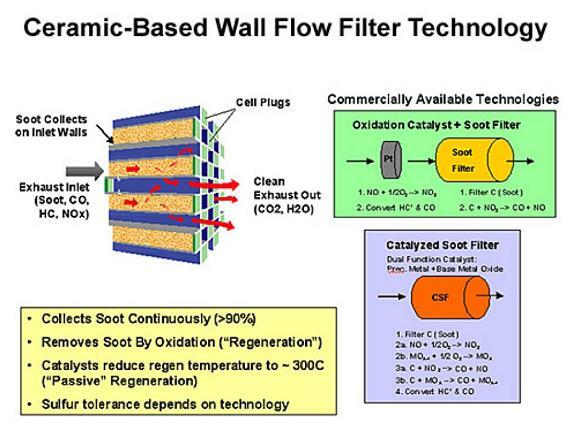 With this in mind the composition of the filter also includes a wash coating to the surface of the filter comprising platinum and other active components; materials used in the manufacture of oxidation catalytic converters. At certain exhaust gas and filter temperatures the catalytic coating promotes combustion and therefore burning of the particulates, while also oxidizing carbon monoxide and hydrocarbon emissions. all essential requirements for an efficient regeneration process. Passive regeneration involves the slow environment-protecting conversion of the particulates deposited in the filter into carbon dioxide. This regeneration process comes into effect when the filters temperature reaches 250*C and occurs continuously when the vehicle is being driven at higher engine loads and speeds. No special engine management intervention is initiated during passive regeneration, allowing the engine to operate as normal. Only a portion of the particulates are converted to carbon dioxide during passive regeneration and due to chemical reaction this process is only effective within the temperature range of 250*C to 500*C. Above this temperature range the conversion efficiency of the particulates into carbon dioxide subsides as the temperature of the filter increases. Active regeneration commences when the particulate loading in the filter reaches a threshold as monitored and determined by the DPF module. This calculation is based on driving style, distance driven and exhaust backpressure signals supplied by the differential pressure sensor. Active regeneration generally occurs approximately every 400 kilometers (250 miles) although this will depend on how the vehicle is driven. For example, if the vehicle has operated for a length of time at low-loads for instance in urban traffic, active regeneration will be initiated more often. This is due to a more rapid build up of particulates in the filter than if the vehicle has been driven periodically at greater speeds, where passive regeneration would have occurred. A mileage trigger incorporated within the DPF module is used as a backup for initiating active regeneration. If after a threshold distance has been driven and regeneration has not been activated by backpressure signals; regeneration will then be requested on the basis of distance driven. .First post-injection retards combustion inside the cylinder to increase the heat of the exhaust gas. .Second post-injection injects fuel late in the power stroke cycle; fuel partly combusts in the cylinder but also sweeps down the exhaust where unburned fuel triggers an exothermal event in the catalyst, raising the filters temperature further. Active regeneration takes approximately 20 minutes to complete. The first phase is to raise the temperature of the filter to particulate combustion temperature of 500*C.
In the second phase the temperature is raised to 600*C, the optimum particulate combustion temperature. This temperature is maintained for 15 to 20 minutes to ensure complete incineration of the particulates captured in the filter. The incinerated particulates produce carbon dioxide and water. 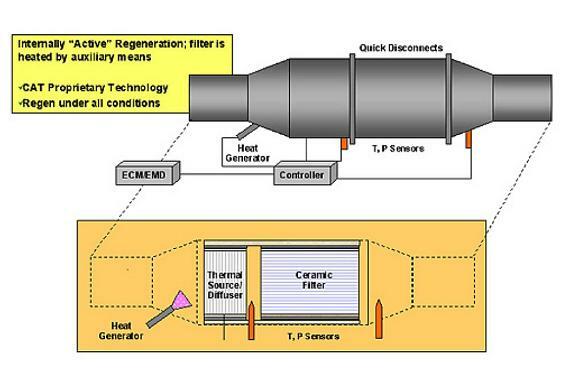 Active regeneration is controlled to achieve a target temperature of 600*C at the inlet of the particulate filter without exceeding the temperature limits of the turbochargers and close-coupled catalysts; refer to ‘Active Regeneration Protection Limits’ below. .The turbochargers are maintained in the fully open position to minimize heat transmission from the exhaust gas to the turbochargers and to reduce the rate of gas flow through the particulate filter. This enables optimum heating of the particulate filter. If the driver demands a higher torque the turbochargers will respond by closing the vanes as required. both of which increase the speed at which particulate filter is heated. .The exhaust gas recirculation (EGR) valve is closed as the use of EGR lowers exhaust gas temperatures and therefore makes it difficult to achieve the regeneration temperature in the particulate filter. .The glow plugs are sometimes activated to provide additional heat in raising the temperature of the particulate filter. To maintain glow plug serviceability the activation period of the glow plugs is restricted to 40 seconds. The regeneration process also compensates for ambient temperature changes. WARNING: Due to the high temperatures which can occur in the particulate filter, care should be taken when working within the vicinity of the filter. .Where the filter can come into contact with flammable materials underneath the vehicle. .Where exhaust gasses emitted from the exhaust tail pipe can come into contact with flammable materials. A disadvantage of active regeneration is engine oil dilution caused by small amounts of fuel entering the engine crankcase during the post-injection phases. This has made it necessary, in some circumstances to reduce the oil service intervals. The driver of the vehicle is alerted to this by the instrument-cluster message centre. An algorithm programmed in the DPF module monitors driving style, active regeneration frequency and duration. Using this information the module predicts the level of oil dilution. When the oil dilution level reaches a threshold value (the fuel being 7% of engine oil volume), a red warning lamp and ‘Service Required’ message is displayed. Depending on driving style, a small percentage of vehicles will require an oil change before the standard 15,000 miles service interval. If an engine oil dilution event does occur the vehicle will undergo its full service and the service mileage counter will be reset to zero by the service technician. Refer to GTR for further information on resetting the service mileage counter. There will be a small increase in fuel consumption due to active regeneration of the particulate filter. During regeneration the fuel consumption approximately doubles. However, because regeneration happens relatively infrequently the overall increase in fuel consumption is small. This is accounted for in both the instantaneous and average fuel economy displayed in the instrument cluster. For drivers who make frequent short journeys at low speeds, it may not be possible to effectively regenerate the particulate filter. In this case, the DPF module will detect a particulate overload condition and a warning message will displayed to the driver via the message centre. This message will read “DPF Full – See Handbook” accompanied by an amber warning light. The driver will be given the opportunity to regenerate the particulate filter by driving the vehicle until the engines normal operating temperature is attained, and then for an additional 20minutes at a speed of 48 km/h (30 mile/h) or above. Successful regeneration of the filter is indicated to the driver by both the message and amber warning light being extinguished. If the message is ignored and no action is taken there is the possibility that the DPF will become blocked. If this occurs the vehicle must be taken to an authorized dealer for the filter to be force regenerated. Refer to GTR for further information. NOTE: There is no requirement to manually remove ash or other stubborn compounds during the life of the filter under normal operation. The diesel particulate filter (DPF) module is incorporated in the powertrain control module (PCM). The DPF module monitors and supervises the operation of the DPF system while also monitoring diagnostic data. The DPF module is divided into three sub-modules controlled by a coordinator module. The DPF coordinator module manages the operation of different features when a forced regeneration is requested or cancelled. .The DPF supervisor module is a subsystem of the coordinator module. .The DPF fuel-management module calculates the timing and quantity of four fuel injections as well as the injection pressure during regeneration. .The DPF air-management module contains the control for EGR, boost pressure, air temperature and pressure in the intake manifold. Once a regeneration request is set by the supervisor module the coordinator requests EGR cut off, and regeneration specific boost pressure control. It awaits a feedback signal from the EGR system indicating that the valve is shut. Once this occurs, the coordinator initiates requests to increase engine load by activating electric consumers and controlling the intake air temperature and pressure. Once it receives a confirmation that intake conditions are adequately controlled or expiration of a calibratable time, it switches to a state waiting for an accelerator pedal release manoeuvre from the driver. If this occurs or a calibratable time elapses, the coordinator initiates a request to control fuel injections to increase exhaust gas temperature. .Timing and quantity of four split injections per stroke (pilot, main, and two post injections). .Injection pressure and transition between three different levels of injection. All of which are dependent on the state of the close-coupled catalysts and the state of the particulate filter. The control injection determines the required injection level as well as an indication of the activity of the close-coupled catalyst and particulate filter. The injection management calculates the quantity and timing for the four split injections, each for the three calibration levels for injection pressure, and manages the transition between levels. The two-post injections are required to de-couple the functionality of elevating in-cylinder gas temperature and production of hydrocarbons (to be burnt in the particulate filter). The first post injection is used to generate higher in-cylinder gas temperature and at the same time retain the same torque produced under normal operation mode (non regeneration mode). The second post is used to generate hydrocarbons which are burnt partly in-cylinder and partly over the close-coupled catalyst, but without producing increased engine torque. .Intake air temperature and pressure control. 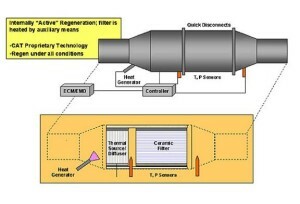 During regeneration, the EGR feature is shut off, and the closed-loop activation of the boost controller is calculated. The module controls the state of the air in the intake manifold to a predetermined level of pressure and temperature. This is required to achieve correct in-cylinder conditions for a stable and robust combustion of the post-injected fuel. The module controls the intake air pressure during regeneration by actuating the EGR throttle and adjustment of boost pressure control. .Temperature before the turbocharger inlet must remain below 830 C for turbocharger protection. 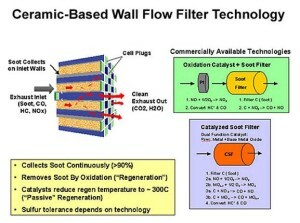 .Close-coupled catalyst in-brick temperatures must not exceed 800 C and exit temperature must remain below 750*C.
In line with a commitment made in 1998, PSA Peugeot Citroën will introduce the first particle filter system (PF) to be fitted as standard, from early 2000, when they will launch the new engine heading up the family of HDi “common rail” high-pressure direct-injection power units in one of the group’s vehicles for the future. By eliminating particles and smoke the PF system will further enhance the advantages the diesel engine enjoys on the score of environmental protection. A diesel engine inherently uses less fuel than a petrol engine and therefore emits less greenhouse gas. This plus-quality is compounded in the HDi engine which in comparison with a classic diesel unit further reduces CO2 by 20%, CO by 40%, hydrocarbons by 50% and particles by 60%. At the same time it offers even more enjoyable motoring. Developed over 18 months, the PF system was brought to fruition thanks to the “common rail” system in the HDi engine which, by its principle of operation, allows total control of all the phases of combustion. Via the engine management system the flexibility of the “common rail” allows the filter to be regenerated, using post-combustion to modify exhaust gas temperature. Until now, the main obstacle to developing the particle filter for the car was regeneration of the filter element by combustion of particles that had been filtered out. PSA Peugeot Citroën has adopted a technical solution which offers efficient regeneration, unnoticeable by drivers and needing no action on their part, yet preserving the pleasures of motoring whatever the conditions of use. A filter unit linked with a pre-catalysator mounted upstream, plus temperature and pressure control sensors. Software linked with the HDi “common rail” engine’s management system, to initiate filter regeneration and control the system’s auto-diagnosis : this is the heart of the system. A fuel additive system, built into the vehicle. The particle filter is a porous silicon carbide unit, comprising passageways which trap particles in the exhaust gases stream. It is notable for its very high filtering efficiency and its ability to retain particles. Regeneration consists of periodically burning up the particles accumulated in the filter element. Primarily composed of carbon and hydrocarbons, particles trapped in the filter burn in the presence of oxygen at a temperature of 550 C.
Regeneration is controlled by the “common rail” injection system, which allows multiple injections to raise the initial temperature of the exhaust gases (around 150 C in urban driving) to 450 C as they leave the exhaust collector box. There are two stages to this temperature increase. A control adapted to the injection system allows exhaust gas temperature to rise to 450 C.
A post-injection of fuel in the expansion phase causes post-combustion in the cylinder, causing the temperature to rise by 200 to 250 C.
Complementary post-combustion, generated by an oxidising catalysator upstream of the filter, deals with the unburnt hydrocarbons resulting from the post-injection. The temperature can be increased by more than 100 C.
To reach the regeneration threshold, the fuel receives a cerine-based additive product, Eolys ®, made by Rhodia, which lowers the natural combustion temperature of the particles to 450 C.
Exhaust gas is continuously filtered. Depending on the filter’s state of congestion, regeneration takes place every 400 to 500 km/250 to 300 miles. To maintain its efficiency, the filter will be cleaned at dealerships every 80 000 km/50 000 miles by high-pressure water, to get rid of cerine deposits. The PF system is part of the overall strategy pursued by PSA Peugeot Citroën to reduce pollutant emissions. By eliminating particles and smoke it endows the HDi diesel engine with an ecological advantage in absolute terms. The PF system allows for further improvement, thanks to complementary catalytic post-treatment Systems lowering gaseous emission levels still further as the quality of diesel fuel itself is improved, especially with the sulphur content reduced to less than 30 ppm. The PSA Peugeot Citroën group will start production of the PF system with the launch of the DW12 TED4 engine at the beginning of the year 2000. This 2,2 litre engine will develop 98 kW power and torque of 315 Nm – offering superior performance to the current 2,5 litre diesel engine.